Net profit of INR 5 Crore or more. Companies thus coming under the CSR mandate, have to spend at least 2% of their average net profits of the preceding three years on social impact programmes in every financial year. c. Be transparent in reporting details of CSR – the activities they undertook and where, and their mode of implementation. In the first 3 years of implementation of this law, over 29000 companies have come under the CSR ambit. 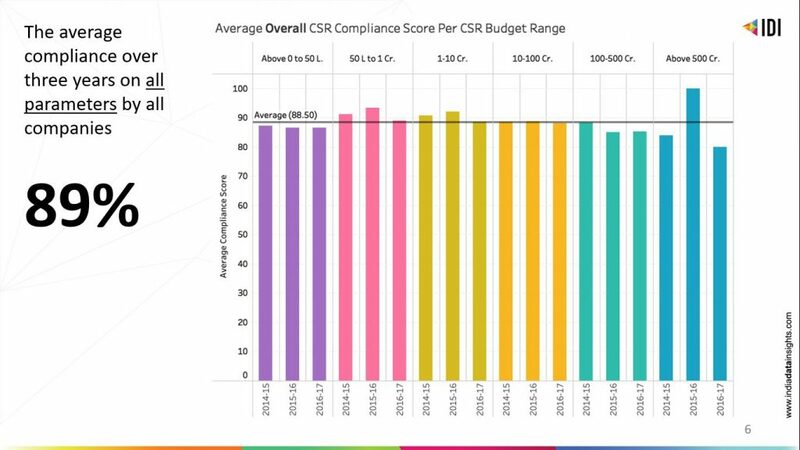 CSR budget range being a good indicator of the company size, we are reporting compliance for each budget range (as categorised by MCA) separately. The graphs on the following pages present CSR compliance data year-on-year. In this report, we have analysed the entire set of companies (total of 29190) on their CSR compliance using the data made available by the Ministry of Corporate Affairs as of January 2019. Please note that the data for FY 2016-17 is not fully updated on MCA portal (as of Jan ‘19), and hence the compliance scores for 2016-17 may go up once the data is complete. The updated version of this report will be available on www.sattva.co.in and www.IndiaDataInsights.com in June 2019. 1. Does the company have a CSR policy? 2. Did the company spend the prescribed CSR amount? 3. Did the company report the causes it supported through CSR? 4. Did the company report where its CSR activities were conducted? 5. Did the company report the mode of implementation of its CSR projects? On CSR compliance, would you like to know how your company is doing?